Surfing in Tenerife is a major activity! There are many beaches round the island providing waves for surfing, whether you are a beginner or an expert. Wherever you're staying on the island, there should be a surfing beach near you. The greatest concentration of opportunities for surfing in Tenerife is around the tourist areas of Los Cristianos and Las Americas. Fear not, though, those of you staying in the north! There are plenty of beaches near Puerto de la Cruz and up on the most northerly tip of the island. 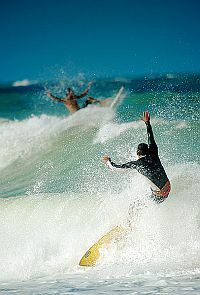 You'll also find one or two other places for surfing in Tenerife dotted around the coastline. The surfing area is a reef break with consistent surf. The best time of year to try it out is winter and the best time of day is high tide. Wind is southerly and the best swell direction is from the north. You might experience a mixture of groundswells and windswells - and beware of rocks and "rips" (strong currents pulling you out to sea). On good days, the beach can get quite crowded and the locals can be, let's say, a bit of a nuisance - and not very friendly. Surfers award this spot 4 out of 5. Another surf spot on Tenerife's north coast, next to the village of Bajamar and about 5 miles from La Laguna. You get consistent surf from an exposed reef break. Wind is from the south. Waves come from both local windswells and non-local groundswells. Best swell direction is from the northwest, best time of year is autumn and winter and best time of day is high tide. One good things about El Charco for surfing in Tenerife is that it never becomes really overcrowded. Surfers rate this spot 4 out of 5. On the coast just south of Punto del Hidalgo, this surf spot has similar conditions to El Charco, but is not as demanding. Ideal swell is northwesterly. Best time of year is winter. Surf quality is not affected by tide condition. Beware of rips and expect crowds. This spot has been given a 4 out of 5 rating by surfers. Further down the north coast, to the west, near the town of La Caleta, is this surf spot, ideal for year-round surfing at any time of day. Having a mixture of windswells and groundswells, the best wind direction is from the south. Ideal swell direction is north-northwest. This is an exposed reef break and it provides both lefts and rights. You will have no problems with crowds here, but beware submerged rocks. Surfers' rating: 3 out of 5. Found on the west coast, between Los Gigantes and Alcala, this is an exposed reef break providing lefts and rights. Surf is fairly consistent, but not so good in the summer. Best wind direction is from the east. You get both windswells and groundswells and their best direction is from the northwest. On good surf days, it can get quite crowded, so be prepared for a certain amount of hassle from locals. Surfers' rating: 4 out of 5. Also known as Palmeras, because it is behind the hotel Las Palmeras in Las Americas, this surf spot has the finest left-hander in Tenerife, if not in Europe. Apart from that, conditions are much the same as Punta Blanca. Prepared to get major aggravation from the locals - it is said that they throw rocks at surfers! Watch out for rocks below the surface, too, plus rips. Surfers award this spot 5 out of 5. Also in the Las Americas area, this is an exposed beach and reef break. The right break is better than the left. Very reliable surf, except in summer. Wind is best from the east and swell is best from the southwest. Best time to surf is when the tide is rising. Beware of rocks. Can get very crowded, so expect the customary aggro from locals. Surfers rate this 2 out of 5. Found at Los Cristianos, this is an exposed reef break with consistent surf, best in spring and summer. Surf comes from groundswells, the best direction being from the south. Best wind is from the north and you can surf regardless of the tide condition. You get lefts and rights, but the rights are better. This spot can get extremely crowded, so extra care is essential. This is an exposed reef break has quite reliable surf, coming from groundswells, ideally from the south. Best wind is from north-northeast. Best time of year is spring and summer and best time of day is low tide. Although this spot doesn't get very crowded, there are, once again, reports of rock-throwing locals. Watch out for rips and beware of rocks in the line-up. Back up to the north of the island, this spot is right up at the top of the east coast. As it is on the leeward side of the island, it provides a sheltered reef break. Quite reliable surf, with winter being the best time of year. Best wind is from the north. You get windswells and groundswells, the best direction being from the northeast. Best surfing as at high tide. This area can get very crowded, so be ready for some interaction with locals. Rating is 5 out of 5. Right up on the far north coast of Tenerife, this is an exposed beach break providing consistent surf all year round. You get both lefts and rights. Wind is generally southerly. Waves come from local windswells and distant groundswells, best direction from the northwest. All stages of the tide are suitable. Can get very crowded, which can prove quite hazardous. Surfers' rating is 3 out of 5. On the north west coast, just a bit further west from Puerto de la Cruz, this is an exposed reef and beach break with consistent surf all year round. All stages of the tide are okay and you get lefts and rights. Ideal wind is from the southwest and you get both windswells and groundswells, ideally from the north. Gets very crowded, so be aware of the potential danger. Surfers award a rating of 2 out of 5. This surf school is situated in Puerto de la Cruz and generally makes use of the beaches in that area. It is, however, also equipped with a fleet of vans to take students all over the island, in search of the best surf. The school provides lessons in practise and theory with qualified instructors. Four a day, they last for 45 minutes and are in groups of up to eight people. Apart from the lessons, your payment includes surf equipment, transport to the beach, a picnic at the beach and liability insurance. Waveexperience also run a "Surf Camp", where, along with the surfing lessons, they provide accommodation in Puerto de la Cruz consisting of a two-person apartment, with a room with two individual beds, a kitchen, a living room and a private balcony. For those of you who want to learn surfing in Tenerife and are based on the east coast, there is this school, situated at El Médano. Founded by world-class surfer, Jean Richard Valverde, this school offers both individual and group lessons. These lessons are one per day and last for two hours. Group lessons are a maximum of five people per instructor. Included in these prices are use of a surfboard/soft board, wetsuit and rashguard, a lecture and a surfing "pop up" demonstration on the beach, surfing skills instruction in the water, plus insurance and the presentation of a Tayurth Surfschool certificate, on completion of the course. Individual lessons also include video support. Instruction is suitable for both beginners and experts and you can pick your lesson time. Subjects covered are ocean awareness, surf etiquette, paddling techniques, and wave riding. Another school for surfing in Tenerife based in Puerto de la Cruz, this offers lessons for complete beginners. Lessons take place at a beach centrally located in the city, called Playa Martianez, which is very beginner-friendly, with waves that are not too steep. Teaching is in small groups and Waikiki offer to video your first surfing successes to take home as a souvenir. To enhance your surfing in Tenerife experience, quality epoxy boards are available for rent. Waikiki also run "Surfaris", with a fleet of 4x4 vehicles to take you around the north of the island, in search of the best surf. Situated in the heart of Las Americas, in the Americas Shopping Centre, this school has been operating for 10 years. Many "graduates" of the school have gone on to become expert, prize-winning surfers. Courses range from beginner to advanced, with a maximum of six people per class. The school accepts children as young as eight. Each lesson lasts for two hours. There are also individual lessons available. Included in the price is equipment and insurance. To help with getting the best out of your surfing in Tenerife experience, K16 also runs Surf Trips, to find the best waves. 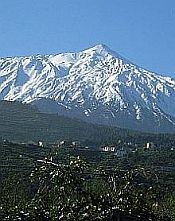 The price is 150 euros and this includes transport, equipment, lunch and insurance. There is a discount for three people or more.